I’m a believer. As a new guy I totally sucked at grinding lathe tools. It’s almost painful to admit how many stubby, misshapen, multi-faceted, overheated and just plain ugly lathe tools I made back then. The amazing thing is that some of those tools actually worked as well as the pre-ground tools that came with my lathe. I started to believe those guys that tell you, “… just get it close and it will work.” Of course, I was too embarrassed to call myself a hobby machinist with those Franken-tools so I bought an expensive set of inserted tip carbide tools that I thought would make a major difference but was disappointed. They couldn’t rough as deep or finish as well as my ugly high speed steel (HSS) tools, at least not on my lathe, so then I believed those guys that tell you, “… stick with HSS on a hobby lathe.” Hey, desperation can make you mighty receptive, you know. Fast forward 15 years and now I believe, after having ground many experimental tools, that the best lathe tool for a hobby-class lathe is a HSS tool with its tip geometry modified to reduce the cutting forces it produces, ground on a belt sander. 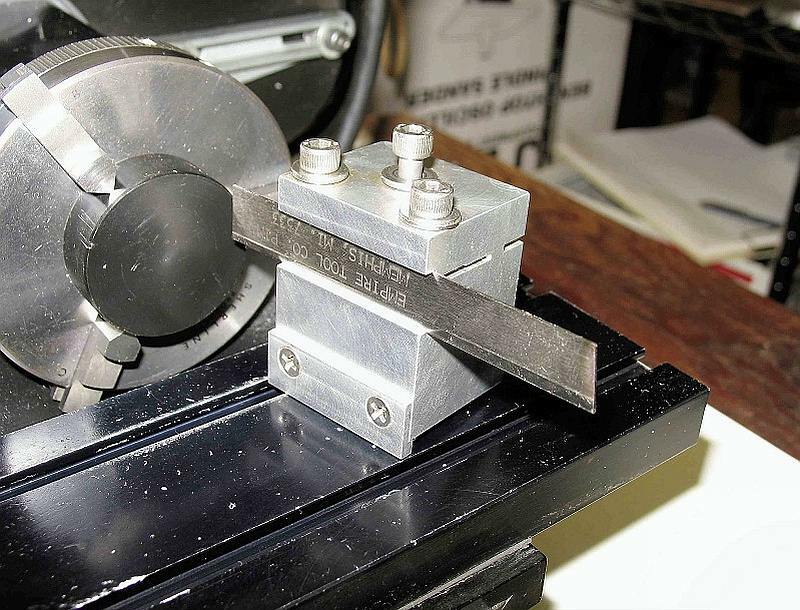 Since standard tools are intended for use on industrial lathes their geometry can produce cutting forces that are excessive at times, especially when roughing but this can also affect sizing and finishing cuts. To be clear, cutting force is that force produced by the tip geometry of the tool that must be overcome to make a cut. 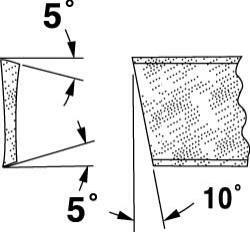 We can look at it as a continuous resistance generated by the shape of the tool as it is pushed through the material during the cut. A standard HSS tool has a broad, wedge shape and creates a lot of resistance (carbide is even worse), so we must dial down our control inputs (depths of cut, feeds and speeds) to use them. If we alter the tool so it has a narrower included angle it cuts with less resistance, thus lowering the rigidity and power needed to make a given cut. We still have to manage our control inputs but since the cutting forces are lower we would expect to be able to cut deeper, achieve better accuracy in sizing and finishing cuts, and finish better with greater ease before running into the rigidity and power limits of the lathe. And this is exactly what happens. To demonstrate this I took a 0.050” deep cut in 12L14 mild steel on my admittedly older hobby-class manual mini-lathe using a very good quality inserted tip carbide roughing tool with a new insert, a sharp freshly ground high speed steel (HSS) roughing tool with standard tip geometry ground for steel, and the general purpose tool with modified tip geometry (not optimized for steel) that was ground for this discussion. The carbide tool made the cut but chatter was excessive. Speed was as low as I could reasonably go and the feeding force was very high. The finish is really ugly due to all the chatter and the chips are tiny and powdery. Reducing the depth of cut to 0.010, the proper depth of cut for this insert, allowed it to cut as it should. The HSS roughing tool did fair but there was a lot of chatter. Speeds and feeds had to be adjusted almost constantly to make it this far. Finish is rough but not excessive for a roughing cut. 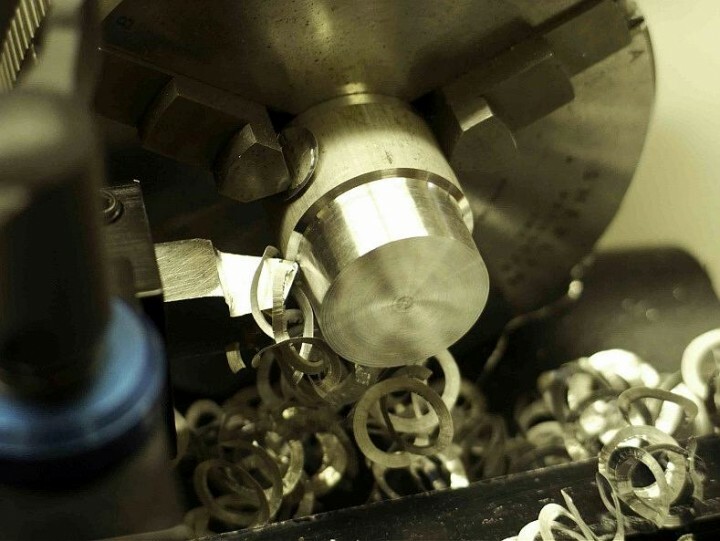 Chips are tightly curled due to the standard side rake. Reducing the cut to 0.030” allowed the tool to work much better. The modified tool cut easily, speed was about 100 RPM higher than with the other tools and there was no chatter at all. Finish is much better compared to the other tools. The chips look more like loose shavings due to the sharper included angle at the tip. 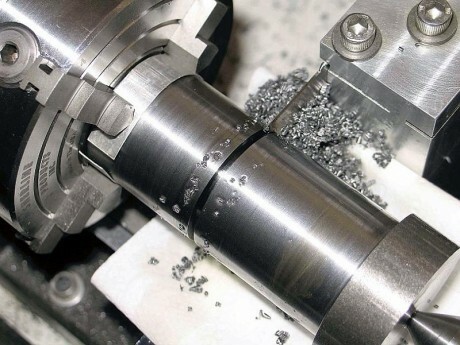 Chips from the carbide tool, HSS rouging tool and the modified tool are distinctly different. You absolutely cannot fake a chip. They tell you exactly what is going on at the tip of the tool. It’s not obvious at first but this video is about the Arthur R. Warner Company’s HSS indexable inserts. After seeing it I’ve decided that I would really like to give them a try. I know you can get a better finish with HSS bits but I don’t like having to stop to sharpen them. So I use carbide inserts. I get a pretty good finish with them and I can cut with a tip for hours before it wears out and I have to rotate the insert to a new one. It looks like the Warner Company’s inserts give you the advantages of HSS along with quick and easy sharpening. 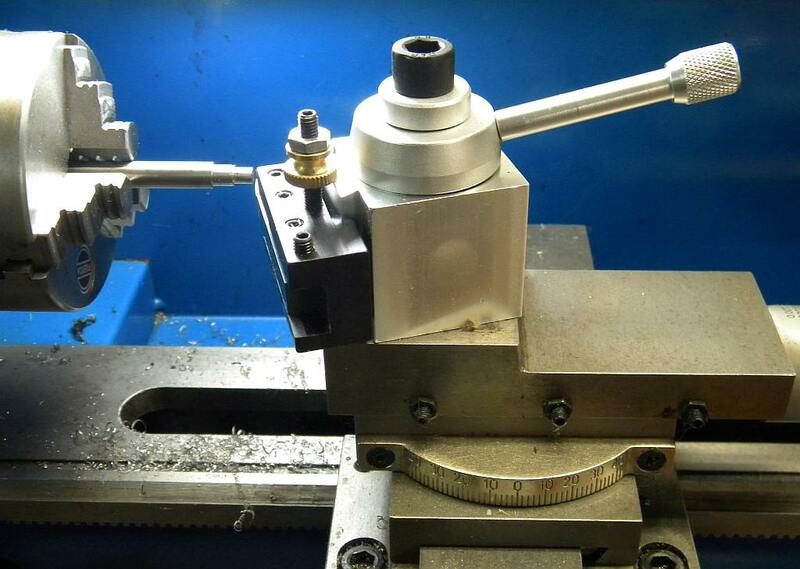 When a tip on the insert gets dull you can rotate to a new one in seconds without losing your lathe bit’s position. And when all 3 tips become dull you can sharpen them by rubbing the top surface of the insert on a whetstone for a few seconds (see video at 2:30). Unfortunately, they don’t seem to sell inserts that will fit my tool holders (TCMT32.52 for my 8×12 and TCMT 21.51 for my 7×12). So if I want to give HSS inserts a try I’ll have to buy a 5 bar turning kit for about $128 or somehow find the time to make a bar that will fit their inserts. The price of their kit is considerably more than what I paid for my imported insert holders but it seems reasonable for a quality American made product. Has anyone bought one or tried their inserts?